COART, E. Les Arts Congolais, Vannerie et Tissage. Par Monsieur Coart, Chef de Section au Musée Congo Belge, Préface de Madame C. Dangotte. Bruxelles: édité par la Renaissance d'Occident sous les Auspices de l'Union des Femmes Coloniales, 1926 portfolio of stiff wrappers, Imp.4to. 34,(5)pp. 43 colour plates, 58 black and white illustrations. The text bound into the portfolio, the plates loose in portfolio as issued. COART, E. Les Arts Congolais, Vannerie et Tissage. 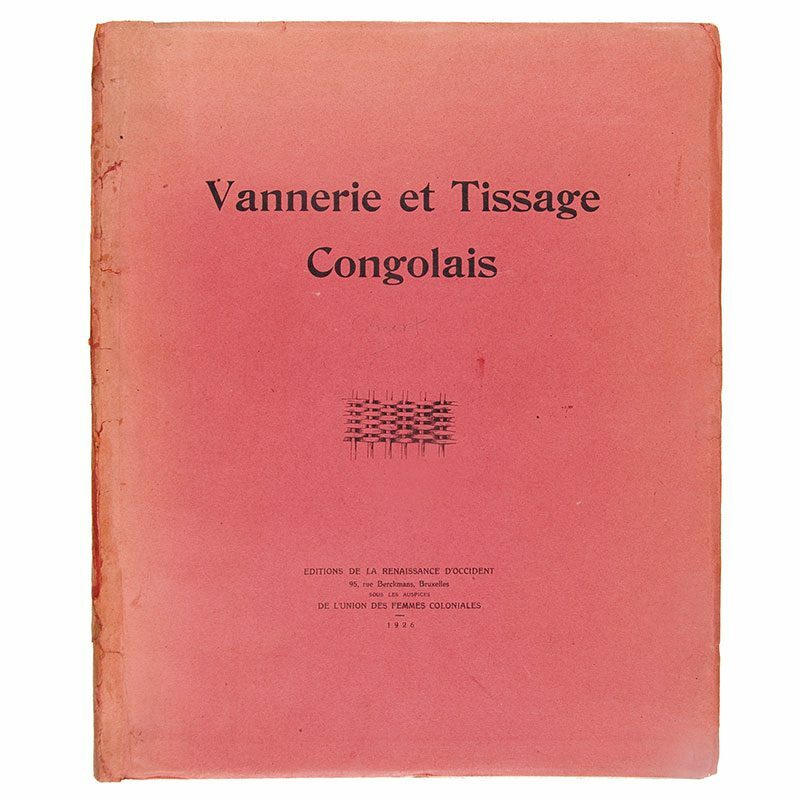 Par Monsieur Coart, Chef de Section au Musée Congo Belge, Préface de Madame C. Dangotte. Bruxelles: édité par la Renaissance d’Occident sous les Auspices de l’Union des Femmes Coloniales, 1926 portfolio of stiff wrappers, Imp.4to. 34,(5)pp. 43 colour plates, 58 black and white illustrations. The text bound into the portfolio, the plates loose in portfolio as issued. The fine plates show 118 examples of mats and rugs reproduced in colour. The plates are numbered XXII-LXIV, the preceding plates being part of the separate publication ‘Annales du Musée du Congo: Ethnographie et Anthropologie, Serie III. Tome II: Les Industries Indigenes, Fascicule 1′ of 1907. The present publication was produced separately from the Tervuren Series but used the colour plates while the text written by Coart was not reproduced in the Tervuren series. Emile Jean Baptiste Coart (1859 – 1924) was a Belgian anthropologist and a curator of the Tervuren Museum. The paper spine on the portfolio has been restored in a similar coloured paper retaining the original lettering, a very nice copy in the publisher’s printed dark pink wrappers. [Gaskin: 3287] COPAC lists the SOAS copy only.